It's always difficult to make something better than what's already good. The Triumph Street Triple 675 set a new benchmark for middleweight sport nakeds, when it redefined accessible performance and practicality. It surely is a tough act to follow, and that's why our expectations from the new Triumph Street Triple family were sky-high. 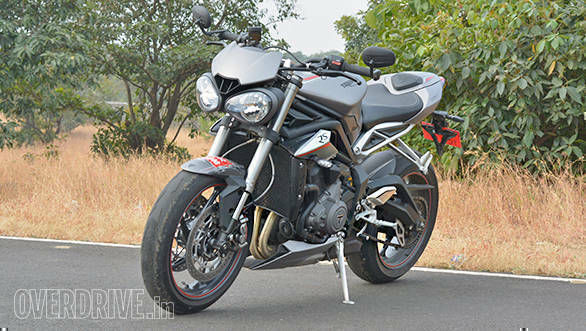 When I rode the 2017 Triumph Street Triple S, it didn't feel like a big step up from the old Street Triple 675. The Street Triple RS however, has left me with a perpetual grin on my face. The moment you look at the Street Triple RS, the word unique pops in your head. 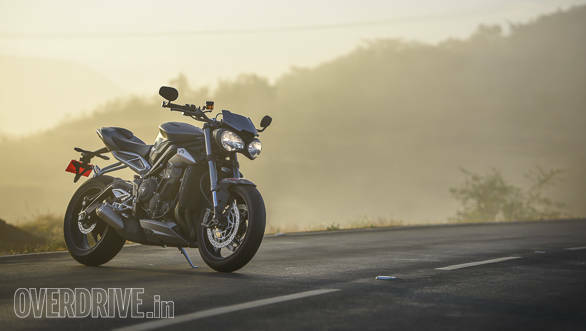 Yes, it does borrow a few design cues from its elder sibling, the 2016 Speed Triple, but on the whole, there's nothing quite like it. 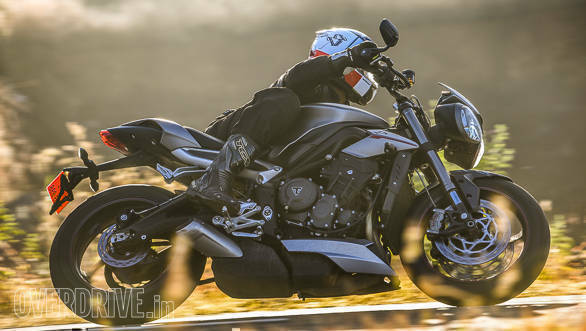 The characteristic bug-eyed headlamps grab your attention at once and may also polarise opinions, but in my books it gives the Street Triple a distinct character. I'd certainly like my motorcycle to have some of that, wouldn't you? The RS' stunning, aluminum matte grey paintwork looks special, while the contrasting red and white stripes accentuate the lines on the bike. The tank looks substantial in the entire scheme of things and the re-profiled rear is as sleek as a bullet. 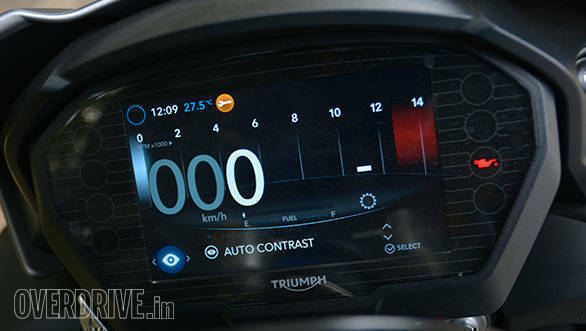 The party piece on the RS is the crisp, 5-inch TFT display, a major upgrade from the LCD instrumentation in the S model. 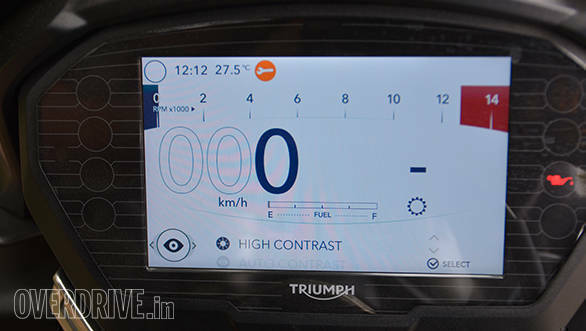 It offers two themes and three styles per theme, each offering a different layout for the speedo, gear indicator and rev counter. I particularly like the big fonts for the speedo and gear position, making it easier to grab a quick glance, especially at high speeds. The auto contrast function is another nifty feature that changes the display brightness to suit the ambient light. You can also choose to leave it at the brightest setting, if you wish. 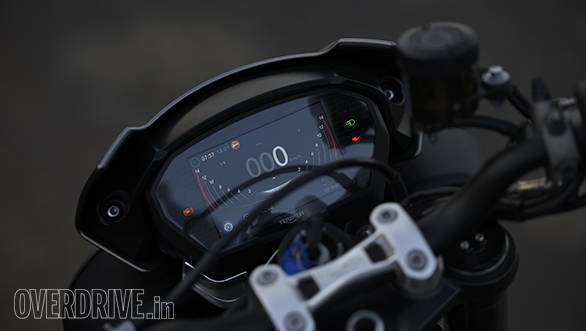 The cluster also displays coolant temperature, lap time, distance to empty, riding mode selected and a lot more. All of this can be accessed via a clever joystick style switch on the left side of the switchgear, which is easy to operate even when the move. Fit and finish levels are excellent and nothing on the Street Triple RS feels as if it's built to a cost. From the switches to the aluminum side stand and forged pillion foot peg brackets, everything oozes quality, giving you a sense of having got your money's worth. 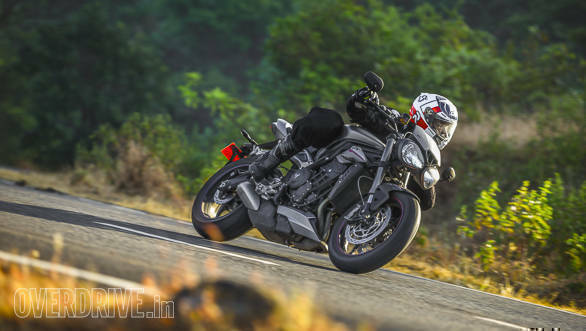 The 765cc, liquid cooled, triple is a bored and stroked version of the original 675cc engine that powered the previous Street Triple. That said, the engine in the RS features 80 new components, including new pistons, con rods and crankshaft. The aluminum barrels are lined with Nikasil that reduces friction and in-turn helps the piston slide easier, keeping engine temperature in check. 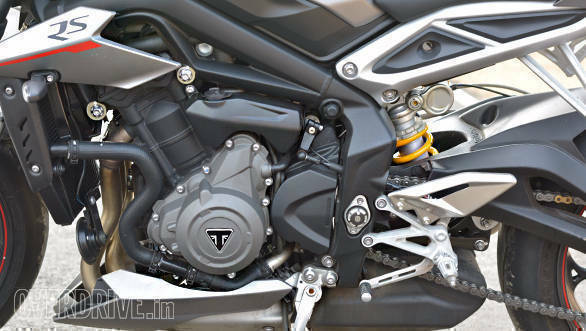 The RS' motor makes 123 PS at 11,700 rpm and 77Nm at 10,800rpm, the highest figures in the Street Triple family. 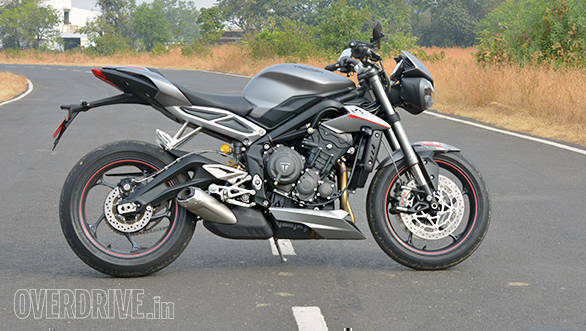 It may seem as a small step up from the Triumph Street Triple S` engine specs, but the refinement feels many notches above. Around town, the impossibly light, slip and assist clutch is a delight to use and the slick six-speed gearbox is as precise as a Swiss watch. The first and second gears offer additional zing and the gives the RS a rather sprightly nature. 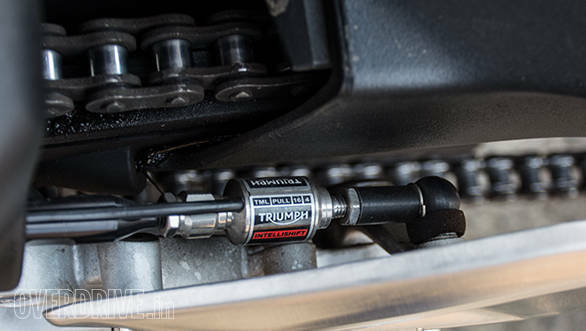 Throttle response, thanks to the new ride-by-wire system is fantastic, allowing you to feed precise throttle inputs. Generous torque in the mid-range improves rideability in the city by quite a margin. You can pootle around town in 5th at 40kmph without a hint of protest from the engine. On the highway, 60kmph in 6th is smooth and all you need to do is open the throttle to overtake, it's that effortless. The engine's tractable nature is also the reason behind the RS returning 20.4kmpl in the city and 24.5kmpl on the highway. Once the road opens, you discover the ballistic nature of the engine. Get past 7,000 rpm and there is a tidal wave of power, accompanied by an addictive intake sound as the engine gulps more air and fuel to propel you to the horizon. 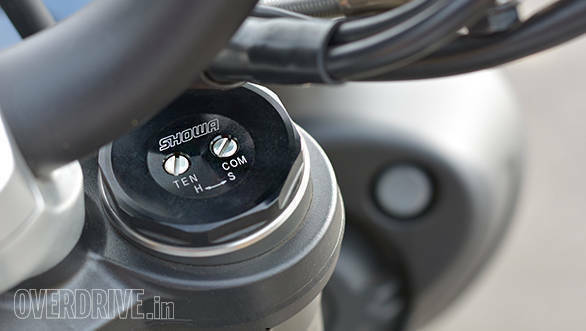 The standard quickshifter also allows for full throttle upshifts, elevating the experience to a whole new level. 0-100kmph is dispatched in 3.49 seconds which is about a second quicker than the S.
Since this is the top spec Street Triple, it gets five riding modes- Road, Rain, Sport, Track and Rider. While all the 123 horses are available in each mode, the clever ECU alters the throttle map to regulate the way it's sent to the rear wheel. The level of traction control and ABS intervention also varies, depending on the mode selected. 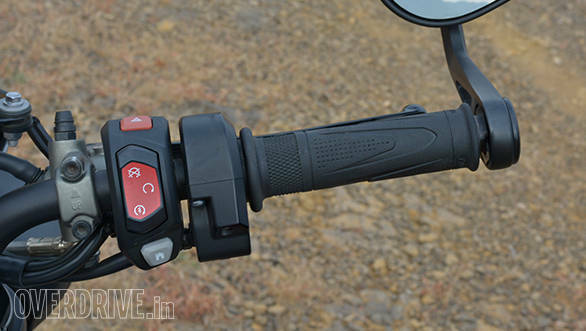 The Rider mode allows you to customize these settings to suit individual riding styles. 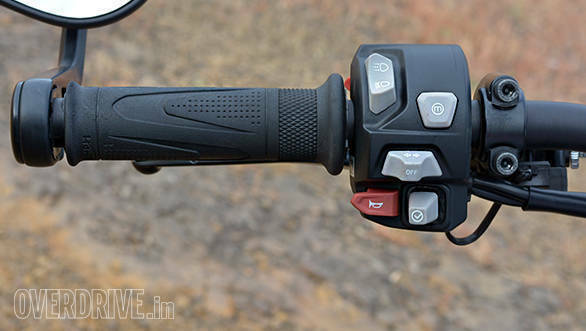 In Road mode, power comes in a gentle manner, but at the same time it feels quick. Sport is suited for riding up canyon roads as power delivery is sharp, helping you exit corners hard and fast. Track, as the name suggests, is ideal for track days, when intervention from the traction control and ABS is the least. You'll also have the front wheel pointing skywards every time to whack the throttle open in the first and second gears in this mode. What amazed me is how easy and predictable all of this felt. I was having so much fun without worrying that the bike may turn around and bite me. Thanks to cyclone Ochki, Mumbai's glass-smooth concrete surface was soaked in the pouring rain, which gave me a chance to test the Rain mode as well. My eyebrows were raised every time I got on the throttle aggressively, surprised by how well judged the power delivery is. It was so good that I didn't have a single instance of wheel spin. 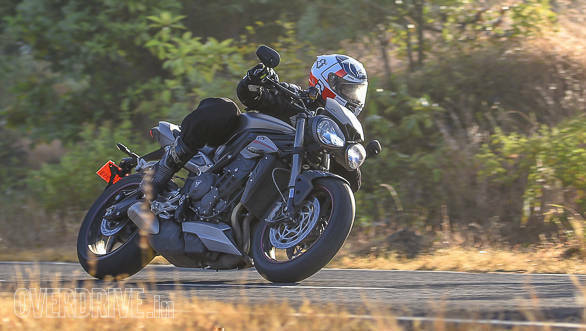 Let's get one thing straight, the Street Triple RS is built as a focused street fighter, with the ability to handle track days. 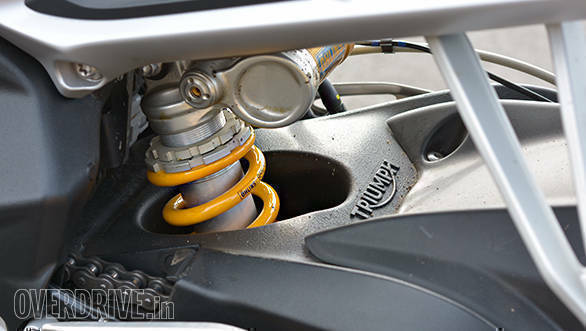 It's for this reason that the fully adjustable Showa Big Piston Forks and the Ohlins STX40 monoshock at the rear are setup to offer a firm yet compliant ride, in the stock setting. It's not jittery or bone jarring at any point, but don't expect it to offer a cushy ride either. The tradeoff here, however, is the stellar handling that the RS offers. The drop in rake by about 1 degree compared to the S has sharpened the handling and as a result, the confidence that the front end offers is massive. The bike tips into corners telepathically, almost as if the bike is reading your mind. The stiffer, gullwing swingarm also instills a lot of confidence as you exit hard out of corners, making it an absolute joy. 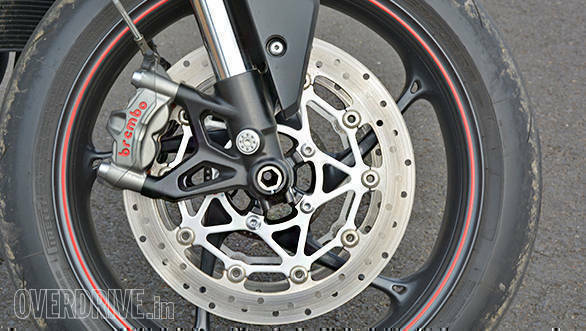 Direction changes too are lightning quick and the confidence that the Pirelli Diablo Supercorsa SPs offer is immense. Anyone with a basic skill set can get on the Street Triple RS and ride it hard. It certainly is a bike that'll make a novice look good and a great rider seem like God. And when it's time to drop the anchors the superb Brembo Monobloc M50 calipers offer tremendous bite and feedback. The progression through the levers is also unlike anything in the segment. 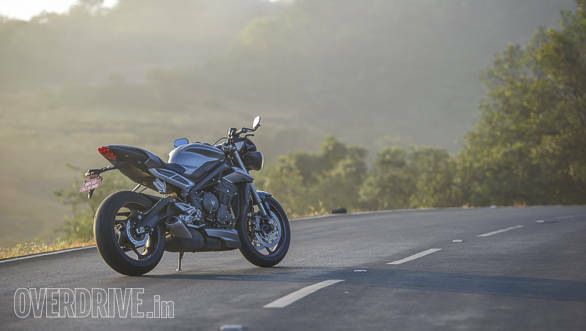 The Triumph Street Triple RS is an absolute gem of a motorcycle. The highlight is its nimble, intuitive handling that'll put a big smile on your face, everytime. It's also a motorcycle that won't be a handful for those who are stepping into the world of big capacity machines. It's an easy-to-ride daily commuter, capable enough to give you the thrills on weekend canyon runs and is specced to handle the occasional track day as well. 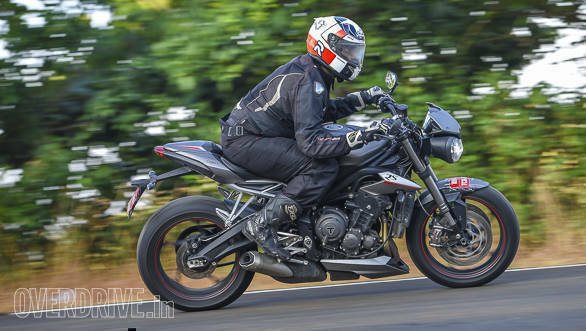 When you consider the litre-class bike rivalling features and the fact that at Rs 12.46 lakh (on-road Mumbai) the Street triple RS only costs Rs 2 lakh more than the S variant, the choice is obvious. The RS is the Street Triple to buy.